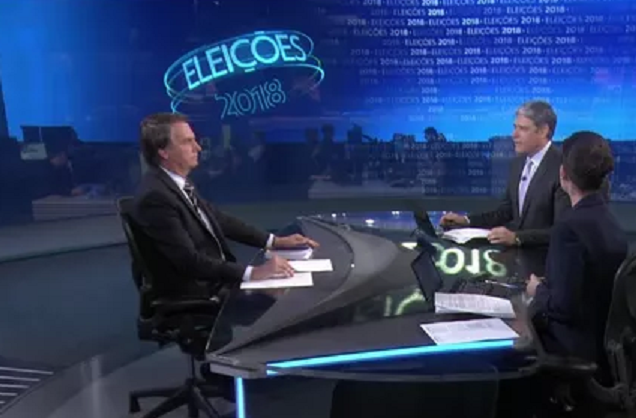 European and US investors will be satisfied when they see the reports coming out of their respective Brazilian locations on the long interview that major television station Globo had with leading rightwing conservative candidate Mr. Jair Bolsonaro, who currently leads the polls for the October presidential elections in South America’s largest nation. Both the Financial Times, Bloomberg and the Frankfurter Allgemeine Zeitung had declared in editorials and interviews in the past few days that European CEO’s did not have an immediate issue with a Presidency of Mr. Bolsonaro and although the mainstream media remains focused on his past quotes which could be considered ‘scandalous’ as per European or US media standards, the performance that he put in during the 27 minute Globo interview will help to ease those worries and reconfirm what investors already thought. Related coverage: <a href="http://thegoldwater.com/news/35361-Brazil-Globo-Will-Not-Interview-Lula-Or-Haddad-Leaving-Bolsonaro-Poll-Leader"> Brazil - Globo Will Not Interview Lula Or Haddad, Leaving Bolsonaro Poll Leader</a>. Mr Bolsonaro spoke at length about his past political career, the carwash scandal (where South American companies Odebrecht and Petrobras were caught paying Workers’ Party politicians which led to the impeachment and even imprisonment of many of his leftwing rivals), his past quotes about the equality between men and women, his alleged homophobia, the unemployment levels and the crime wave that has hit the country. Related coverage: <a href="http://thegoldwater.com/news/35180-Brazil-Facebook-Continues-To-Censor-Bolsonaro-Supporters">Brazil – Facebook Continues To Censor Bolsonaro Supporters</a>. Although Globo is sometimes portrayed as being pro-conservative candidates, the interviewers Mr. William Bonner and Ms. Renata Vasconcello did not give Mr. Bolsonaro an easy pass and he was put on the defensive many times. He also referred to the impeccable actions of the Brazilian army to keep the peace in Haiti when it was raged by an earthquake. Who said jews hate him? You're a f****ng antisemitic! He went to Israel and he is a strongest Israel supporter. So, shut up!